There Is Very Little Water In The Top Loader Washing Machine. Is This Normal? There Is Very Little Water In The Top Loader Washing Machine. Is This Normal ? 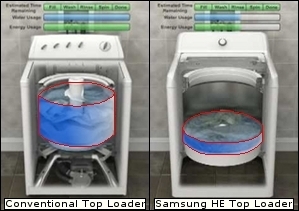 Samsung High Effenciency Top Loader Washing Machines are designed to use HE detergent and as little water as possible for energy efficiency. The water level may appear to be too low, but this is normal. This is a common misconception due to "non-HE" top loader models that commonly use over 40 gallons of water per cycle. Our HE Top Loaders only use up to 27 gallons of water. How to use the 'Smart Check' function? “EN” is displayed on the control panel at the end of the wash cycle. Is this a fault?